Thanks, Mary Ann, for hosting! I share a Beatrix Potter poem at http://teachpoetryk12.com/miss-potter/. Thanks so much for doing the Poetry Friday Roundup this week! At Wild Rose Reader, I have an extensive post about apostrophe/poems of address. It includes some of my original poems--as well as links to other poems of address and a book recommendation. Since last Poetry Friday, I've had new poems by Georgia Heard, George Ella Lyon, Jacqueline Woodson, Graham Denton, Francisco X. Alarcón, and Liz Garton Scanlon, too. I hope folks come by and check 'em out! Thanks so much for hosting Poetry Friday, Mary Ann. I have a two-fer. I love the cover of "Mother Poems," Mary Ann! The collage really works. Thanks for hosting! I'm looking forward to seeing what everyone is posting today. Thanks for hosting! I heard Hope Anita Smith speak -- she's amazing! I posted the 30th poem in my National Poetry Month poem-a-day personal writing challenge. It's a poem about what it's been like to write a poem-a-day. That poetry book of Mother Poems looks really wonderful. I am going to have to find it. Thanks for hosting today! I have the last in my National Poetry Month series of haiku/haiga up. Today I am thinking about dandelions & empty seed heads. What a great month it's been! I'm in this week with an original poem, looking at motherhood from a different perspective. Mary Ann, thanks for hosting and posting. I'm such a fan of Hope's too. Today, I'm wrapping up my celebration of Poetry Month with a new, original poem by Jack Prelutsky, concluding my game of Poetry Tag. Thank you for hosting. This book looks both beautiful painful and beautiful. Today I have my last poem of NaPoWriMo, "Worm's Wish" and also a spotlight on a first grade class's Poet-Tree. I'm sad to see this month end! Thank you for hosting, Mary Ann, and for profiling such a powerful-sounding book of poetry. I must seek it out. Sally is up for PaperTigers' contributuion to Poetry Friday with a different kind of from-the-heart poetry - JonArno Lawson's Think Again. Over at The Drift Record I have a poem from a strange and obscure little book first published in 1907 called How To Tell the Birds from the Flowers. The poet (and illustrator) is Robert Williams Wood - wonder who he was? This week on the Stenhouse Blog we have an "accidental" poem about what kids wonder. The poem comes from Georgia Heard's recent book, A Place for Wonder. Oh! What a great book review!!! 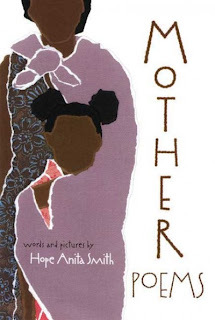 Hope Anita Smith is amazing, and her work is just so touching. Thanks for hosting Poetry Friday. Today at My World/Mi Mundo I review the new poetry book: Poetry Speaks Who I Am. A fantastic new poetry book! Mother Poems sounds lovely and heart-wrenching---thanks for pointing it out to me. I'm in today with the poem I carried in my pocket yesterday: Marie Ponsot's One is One. Oh I LOVE Mother Poems! Excellent choice. It looks like a beautiful book, Mary Ann. I'm reading Jeaninne Atkins "Borrowed Names" -- also mother/daughter poetry. Thanks for hosting. I'm in with an original poem today. Here. Over at Random Noodling I have egg poems. Have a great weekend! I love Hope Anita's Mother Poems--so gorgeous and heart-wrenching. Mother Poems looks wonderful. Thanks so much for featuring it today, and for hosting! I'm wrapping up my Poetry Potluck with a poem by Joyce Sidman, and a giveaway for Red Sings from Treetops: http://jamarattigan.livejournal.com/415410.html. I've also posted a complete list of Potluck Poets with links to their poems and recipes: http://jamarattigan.livejournal.com/415674.html. Mary Ann, Thank you for hosting and for posting a link to Hope reading. I was moved by Mother Poems, words and pictures. I haven't read Mother Poems but I loved Anita Hope Smith's other two titles. Thanks, Mary Ann! I'm in with a post from the PETA website celebrating this last day of National Poetry Month. Not all my work is okay for kids (more for moms), but I think #50 would be! Thanks, Mary Ann. I have posted a poem called "Self Portrait" written by a student a few years ago. I'm sharing a twist on a few old Stevenson standards by Franklin Pierce Adams over at The Write Sisters. Thanks so much for hosting, Mary Ann! A book like this is sure to bring on a few tears, especially for those of us that are mothers. Thanks for sharing. I'm participating in the Savvy Verse & Wit National Poetry Month Blog Tour and Poetry Friday with a post on read aloud poetry. Please stop on by and let me know your favorite poetry related books to share with young children. And in celebration of Arbor Day, we have crafted a "POET-TREE"
I'm in today with Longfellow's poem A Psalm of Life. At Blue Rose Girls, I have a Favorite Poem Project video of a fifth grader named Katherine Mechling reciting Theodore Roethke's poem "The Sloth." I posted Spring Song at Bildungsroman today. Mother Poems sounds so lovely -- thanks. My Poetry Friday post is here this week. Thanks for hosting! I'm offering up "Stanza," a picture book in rhyme --written by Jill Esbaum and illustrated by Jack E. Davis. thanks for doing the roundup!! Thanks for your kind words about my Poetry Month poems! Thanks for reminding me about the importance of poetry. I don't know why I haven't been reading them to the kids all along, I loved poems as a child. I did however read Natalie Tinti's book titled, "Sewing a Friendship," a cute fun book about the importance of healthy friendships- so I feel validated in the fact that at least I am reading good wholesome books to the kids. I plan to make more of a conscious effort to read more poetry thanks to this post.